South of the craggy coires of Lochnagar lies a high mountain plateau called the White Mounth. It is dominated by two Munros - Carn an t'Sagairt Mor and Carn a'Choire Bhoidheach. Both can be climbed together on a fairly long day out from Braemar. The walk starts at a parking area on the A93 opposite the farm at Auchallater, a couple of miles south of Braemar. A track rises to a gate, then strikes out east, following the Callater Burn upstream through a wide, heather-clad glen. The way follows the route of an old drove route - Jock�s Road - which ultimately climbs over Tolmount before descending into Glen Clova. We�re not following it that far - just as far as Loch Callater, five kilometres walk from Auchallater by a good track. Part way along, the Callater Burn is crossed at a substantial wooden bridge and not long after this, Lochcallater Lodge, perched on the northern tip of the loch, is reached. There�s no need to enter the fenced confines of the lodge as the path to Carn an t-Sagairt Mor strikes left as a gate and wall behind the building are reached. However, there�s an MBA bothy next to the lodge - Callater Stables - and this is a fine refuge for a break if the weather�s bad. Back on the path, it climbs alongside a tiny trickle of a stream, gaining reasonable height, soon offering up a fine view over the loch to the slopes of Carn an Tuirc, another Munro, on the other side. 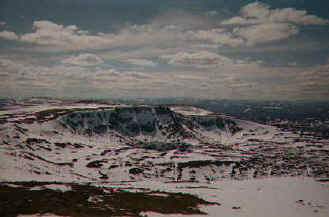 Below this rounded summit is the deep coire occupied by Loch Kander. A short way on, the path bear right and rises at a more gentle gradient along the hillside, running parallel with the shore of the loch below. It curves north east round the shoulder of Meall an t-Slugain and the path is fairly muddy underfoot here. As you progress, the gradient starts to stiffen as the path rises on to Carn an t-Sagairt Mor. Higher up, it converges on a line of metal fence posts at a gate. The most direct way to the summit is to follow the fence line which ultimately leads to a substantial cairn. The summit slopes are scattered with large pieces of wreckage from a Canberra aircraft which crashed here in January 1956. These include pieces of fuselage and sections of wing. To continue on to neighbouring Carn a�Choire Bhoidheach follow the path as it descends into the col before climbing over the stone-strewn slope of Carn an t-Sagairt Beag to a small cairn on the top. It�s worth making a small half mile detour along the cliffs to The Stuic buttress where there are spectacular views over the rocky coires below and down to the Dee valley. Head south, cross over the path heading to Lochnagar, and a short, easy ascent takes you on to the summit of Carn a�Choire Bhoidheach, the cairn sitting amid a scattering of rounded slabs of rock. Cut west down the hillside, to the Lochnagar path and follow this round the southern flank of Carn an t-Sagairt Mor. This leads back down to Lochcallater Lodge and the final stretch of the route is via the Glen Callater track down to Auchallater. Maps OS Landranger sheets 43 and 44. Start/parking Auchallater on the A93 (grid ref 156883). Grading Two straightforward, although fairly remote, Munros. Track and path throughout. Care needed in mist due to the rolling, featureless terrain.